Fifty-one dead at dawn. A doctor who said he preferred not to give his name lives in an apartment building that overlooks the Republican Guard barracks in Cairo. He told me he woke for the dawn prayer before 4 A.M. Shortly afterward, he heard gunfire and went onto his neighbor’s balcony for a better view. “I saw that the Army retreated about ten metres and began to fire tear-gas cannisters, about ten or fifteen of them,” he said. “I couldn’t see if the other side [the protesters] was shooting, but I heard people through megaphones encouraging jihad. Then I saw four to six motorcycles coming from the direction of the Rabaa intersection to the Republican Guard barracks. Some people were still praying, some were not, because the dawn prayer had finished by then. The men on the motorcycles were all masked, and it was hard to see them through the dark and the tear-gas smoke, but they seemed to be shooting, they were coming from behind the protesters, so they were shooting toward the protesters and the Army. Then the Army started firing. And the protestors were firing. I saw firing from both sides.” As for details, though—what they were firing, whether it was one or two protesters or something more organized—he said that it was dark and that he couldn’t exactly tell. Men on motorcycles. It is a maddening detail, constantly repeated over the past two and a half years. It has parallels even in the January 25 incidents of snipers firing into Tahrir Square. Back then it was widely suspected to be the police, but to this day no one knows – as no one has been convicted. If it was the police trying to disperse the crowds, it was a woefully unsuccessful strategy. If anything, the crowds increased and the nation turned against the government. The result, coupled with continual suspicion against the Muslim Brotherhood, made people argue the opposite: Snipers were with Hamas, who acted on behalf of the Brotherhood to help the revolution succeed. Here and there since then, the theory goes, Hamas reappeared to do the dirty work. Liberal revolutionary activists I know hate this theory, as they believe it is old regime propaganda to let themselves off the hook. Even so, the commission which studied post-revolutionary transgressions on the part of the military – also often assumed to be old regime partial – gave its report to President Morsi, who let it sit on his desk. Did he hold it as leverage to use against the army? Leaked pages suggested their wrongdoing. Or did he hold it because Hamas was implicated therein? To this day – though the day is still early – we do not know. What is in the report? And who rode the motorcycles? Was it Muslim Brotherhood sponsored, seeking to provoke the army and paint them as killing innocent civilian protestors? Was it the army itself, raising a false flag against the Brotherhood to paint them as extremists and justify jailing their leaders? Was it jihadists seeking to create chaos? Was it foreign powers wishing to do the same? Every conspiracy floats well in a sea of obscurity; they sink where transparent systems are in place. First: MB ignored completely the Egyptian people who asked Morsi to leave as if they are just ghosts. They want to put in equation: MB and the military. It had been always the MB strategy: We (the civil state) vs. the army (military regime) and always neglected the Egyptian people as if there is a vacuum outside these two entities. Second: Ignoring the Egyptian people we reach this conclusion: the army toppled Morsy and his regime. Third: Reaching this result we get a new equation: Fighting the army is a national and religious duty. Fourth: MB international mass media (CNN, Jazira and I would say Euro news) must confirm this equation putting the Egyptian army at the same ignoble level as the Syrian army. Fifth: This will bring us to the big game in Sinai. The big battle against this “dirty” army will be deployed in Sinai. Beltagui threatened that violence in Sinai will continue in case Morsy will not return. It means that if you will not give us Egypt again we will get Sinai and establish our Emirate with the help of Hamas and all jihadists. Something is better than nothing. Natanayahu asked all Israel citizens to leave Sinai immediately. The Egyptian army sent military reinforcements to Gaza borders. A priest assassinated in el Arish. It seems that Russia supports the Egyptian army with a “military satellite” to track the militias in Sinai. Most probably the scenario they want to implement is to establish an Egyptian sub-state on the area Gaza/Arish under Morsi’s legitimacy (the legitimate president of Egypt). This State will be blessed by Israel and US. Most probably, this is the reason why US don’t want to announce officially if what happened in Egypt is or is not a coup. They are keeping this card to the last moment. It was not in US “best interests” to decide yet whether the armed overthrow of the country’s elected president amounted to a coup or not. If Hamas will get this area (Gaza/Arist) and will establish their new State, US will announce that 30th of January had been a coup. If Hamas and all other Jihadists will fail, US will announce that it was not a coup. On the other side, the army deployed military forces in Suez, Ismailia, Port Said and Suez Canal is under strict control. Closing Suez Canal would be an excellent argument to allow international forces to occupy this vital passage. In this case, the Egyptian army will have problems to go to Sinai and will help the Jihadists to do whatever they want. This is my reading of the events. I hope that I am wrong. No doubt that the best thing to do to stop this “crescendo” is to announce clearly, loudly and officially that 30th of June had not been a coup but the revolution of a people who are looking for their freedom. 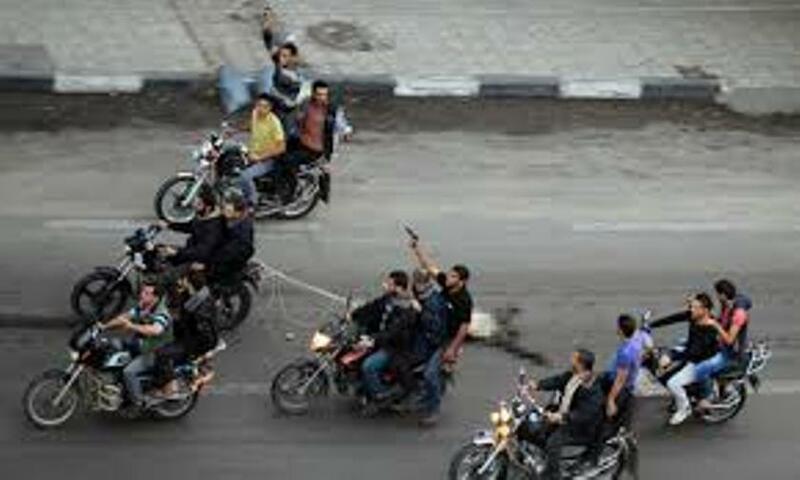 Judge for yourself, but to reach a place of stability, Egypt needs to know who rode the motorcycles.